WILLEMSTAD - Member of Parliament for MAN, Giselle McWilliam should be prosecuted. This is according to Gerrit Schotte MP. 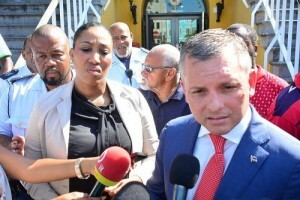 The MAN MP has made herself guilty of slander, said Schotte. Immediately after the violent act against her on February 23 by the MFK MP Jacinta Constancia, McWilliam said that the action was prepared and planned by Gerrit Schotte. This is an insult, according to Schotte. This is an attack on his honor and good name. Should the OM refuse to prosecute McWilliam, Schotte will apply an Article 15 procedure to force the Public Prosecution to prosecute the MAN MP.